Truth Or Slumber: Can We REALLY Blame Obama? That our President simply reflects the spirit of the people who elect him. To that I'll add, that this is true for ALL of our leaders, from Washington to the smallest office in the land. 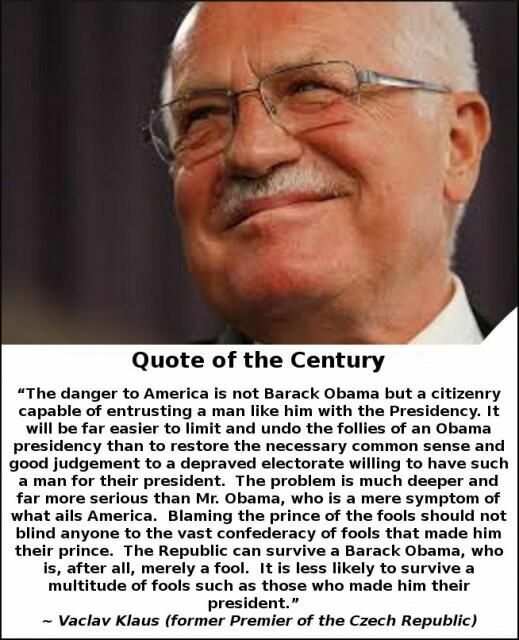 After doing a search about the quote seen at the top, I found several places where it was claimed, to have been said by former Czech Republic Premier, Vaclav Klaus. Searching for it under that attribution led me to sites that debunked the quote and it's origin as false. If life has taught me anything, it is to be tenacious, so I continued searching and at last found the original quote and a claim of authorship by Gary Beasley. Sure enough if you go to his blog you will see he posted the EXACT quote on July 6, 2009. "H.L. Mencken, Born 1880 - Died 1956, was a journalist, satirist & critic, and a Democrat! He wrote an editorial while working for the Baltimore Evening Sun, which appeared in the July 26, 1920 edition. --- H.L. Mencken, The Baltimore Evening Sun, July 26, 1920"
As I watch the change in the nation during my lifetime, and see it's destruction at the hands of our leaders in Washington, and across this great nation, I've often wondered how it could be happening. But as events around our country unfold and I see the civil discord and hatred spilling out our population, and the erosion of our basic morals and decency, I finally see it is in fact, "We The People" who are orchestrating and RESPONSIBLE for this change! Not some politician from EITHER party...but US!